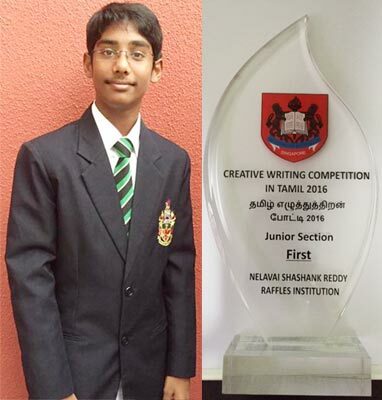 Singapore: Shashank, who is studying Year 2 Integrated Programme (equivalent to eighth standard) in the prestigious school of Singapore by name Raffles Institution has emerged first in the National Level Tamil Creative Writing Competition conducted by Ministry of Education, Singapore. His parens, Dr. S .Padmapriya, and N. Srinath, Indian citizens and Permanent residents of Singapore, staying in Singapore for the past 15 years but native of Chengalpattu, Tamilnadu. Thier only child Shashank is studying Tamil as his mother tongue language. Shashank was honored by the Director and Deputy Director, Mother tongue division, Ministry of Education, Singapore.